Achalasia cardia is a rare condition. The main symptom is difficulty to swallow, called dysphagia. You may get a feeling of blockage or sticking of food behind your breastbone. You may bring up foul-smelling, semi-digested food. Also, you can have heartburn, pain in your chest or in the upper part of your abdomen (tummy), coughing, breathlessness, hoarseness of voice, sore throat and weight loss. Food does not simply fall through your oesophagus (gullet) into your stomach. The muscle in the wall of your oesophagus actively pumps (called peristalsis) food and drinks downwards. There is a valve (called the lower oesophageal sphincter) at the junction of your oesophagus with your stomach. This valve relaxes as food comes in to the lower end of your oesophagus so that food can enter your stomach. In achalasia cardia, there are two problems: (1) the pumping action of the wall of your oesophagus becomes very weak and (2) the sphincter does not relax to allow food to pass in to your stomach. Foods backs up and collects in your oesophagus. The exact cause for achalasia is not known. It is thought that achalasia is an ‘autoimmune condition’, in which your body’s own defence mechanisms cause damage to the nerves in the wall of your oesophagus. Because of damage to the nerves, the muscles and valve do not work properly. If you have symptoms of achalasia, the initial tests are endoscopy and barium swallow x-ray. These tests may show that your oesophagus is dilated (swollen) with food and liquid. The muscles of your oesophagus can appear to be inactive. 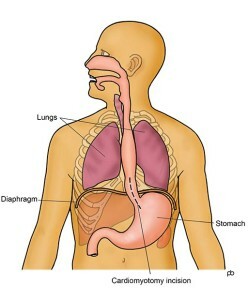 The junction of your oesophagus with your stomach may look quite narrow. These findings suggest achalasia but do not confirm the diagnosis. The definitive test is High Resolution Manometry. This test confirms the diagnosis of achalasia and identifies the type of achalasia that you have. There are three different types of achalasia and each responds differently to treatment. The aim of treatment is to allow you to eat and drink comfortably. The goal is to keep is the lower sphincter of your oesophagus (gullet) open so that food and drink can pass easily into your stomach. 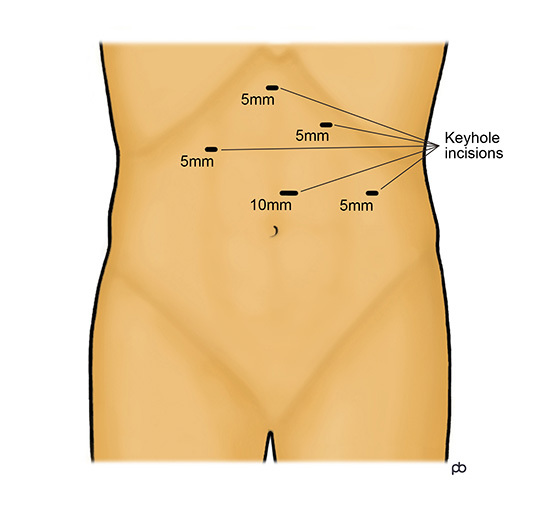 One way to open up the sphincter is by keyhole surgery (laparoscopy): called Laparoscopic Cardiomyotomy or Heller’s Operation. Alternatives to surgery are balloon dilatation of the valve, injection of Botox® in to the valve, cutting the valve by endoscopy (called Per-Oral Endoscopic Myotomy or POEM) and medicines. The operation for achalasia is called Laparoscopic Cardiomyotomy or Heller’s Operation. The operation is done by keyhole surgery (laparoscopy). The operation is done under general anaesthesia and takes about 90 minutes. You will be admitted to hospital on the morning of the operation, and you should be able to go home on the next day, after overnight monitoring in hospital. 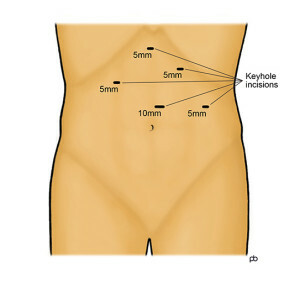 Five very small (keyhole-sized) cuts are made on the upper part of your abdomen (tummy). Using a special surgical instrument, called an ultrasonic shear, the muscle of the lower sphincter of the oesophagus is cut over about 3-4 inches (8-10 cm). The entire thickness of the muscle is cut so that the sphincter cannot hold up any food or liquid. The innermost lining, called the mucosa, of the oesophagus is left intact so that food and drink can pass easily along the normal passage. An endoscopy is done during the operation to check that the muscle has been divided sufficiently and that the inner lining is not damaged. Opening up the sphincter can lead to reflux of acid from the stomach in to the oesophagus. To prevent acid reflux, an anti-reflux procedure is done after the muscle has been divided, as part of the same operation. This anti-reflux procedure is called an anterior fundoplication. Basically, the fundoplication is to wrap a portion of the wall of the stomach over the lower end of the oesophagus. This wrap controls acid reflux without causing any hold up of food or drinks. At the end of the operation, the keyhole cuts are closed with dissolvable stitches. What is the success of the laparoscopic cardiomyotomy operation for achalasia? Studies have shown that cardiomyotomy gives good symptom relief in up to 95% of patients. Information about the type of achalasia from High Resolution Manometry testing is valuable to predict the success of the operation. The best results are seen in patients with Type 2 achalasia (95% success). With Type 3 achalasia, the results are least good (65% success). With Type 2, the results are intermediate (80% success). There is some risk of recurrence of symptoms, following initial relief after a cardiomyotomy operation. What are the risks of Laparoscopic Cardiomyotomy? Most people may a straightforward recovery and serious complications are rare. But all keyhole (laparoscopy) operations on your abdomen (tummy) carry some risks. A specific risk of achalasia surgery is perforation of the innermost layer, called the mucosa, of the oesophagus (gullet). The mucosa is a thin and delicate layer that is attached to the muscle and it is prone to accidental injury whilst cutting the muscle. The risk of injury to the mucosa is increased if you have previously had Botox® injection or balloon dilatation for treatment of achalasia. The mucosa is checked carefully during the operation. If any perforation is found, it is repaired carefully by stitches. The concern is that a small perforation may not be visible during the operation and there can be leakage of contents of the oesophagus in to the inside of the chest or tummy. Leakage is a rare complication but it can cause very serious infection. Leakage produces severe pain, fever and a general feeling of being very unwell. What is the aftercare for Laparoscopic Cardiomyotomy? You should take only liquids for the first week after the operation, and you must not eat any solid food. After the first week, you can take very soft (sloppy) food for the next 3 weeks. You can start eating solid food after one month. Also, you should not take any tablets or capsules for the first month after the operation. All medicines should be dissolved, crushed or syrups for one month. The purpose of the restrictions on eating and medicines is avoid stress on the thin inner layer of the gullet. What are the alternatives to Laparoscopic Cardiomyotomy? Achalasia surgery (laparoscopic cardiomyotomy) opens the lower sphincter of the oesophagus (gullet) by cutting the muscle under direct vision. A second way of opening the sphincter is by passing a special balloon through the mouth and inflating the balloon in the lower oesophagus. This is called Pneumatic Dilatation. Achalasia surgery and pneumatic dilatation have similar success that lasts for up to 5 years, but 1 in 4 of those who are treated by dilatation need more dilatation procedures during follow up. A third way is to cut the muscle layer by endoscopy. This technique is called POEM (Per Oral Endoscopic Myotomy). A fourth way to relax the sphincter is to do an endoscopy and inject a drug called Botox® into the sphincter. The effect of Botox® is temporary. Finally, Nifedipine and Isosorbide Dinitrate are medicines that can be used for temporary relief or in patients who are not medically fit for other treatment.